Living Room Songs is a collection of pieces recorded by Ólafur Arnalds which, some of you may recall, made the number two slot of my Top 5 Writing Music Albums of 2011. While I was busy last November, drafting short fiction while listening to the album on repeat, Andy Harrod was going one step further and writing flash fiction directly inspired by the moods and tones of each of the seven tracks. The result is the excellent Living Room Songs. Andy presented each piece on his blog to read for free, perhaps inspired by the tracks of Living Room Songs being available for free download on the album’s website. Following this, he decided to produce a limited run physical release. Living Room Stories – Handmade Edition comes in the form of a seven-inch vinyl sleeve containing a front cover and the seven individual stories presented upon separate cards, each with their own attendant artwork. For anyone of the generation that remembers handling vinyl singles it is a wonderfully tactile choice that fits the music-inspired nature of the project perfectly. Each piece provides a glimpse of a scene, telling the story of a couple in snapshot, each ‘track’ managing to remain both separate from yet still informing the others in the set. I found the stories compelling and not a little mysterious. 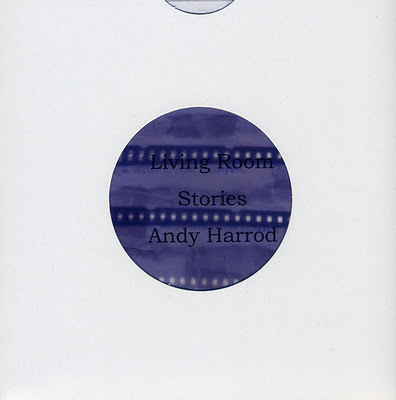 The spaces that Andy Harrod leaves within the ‘story’ of Living Room Songs allow the reader to fill in the gaps and make the story along with him. Such an approach works well alongside the music as the prose mirrors and maintains the tone and mood of the piece it is inspired by, a feeling or image carrying the reader in the same way that music carries a listener. In fact, I followed the advice of the introduction and took the time to listen to each track along with the reading of the relevant piece, something I would recommend (the songs can be downloaded for free, and indeed purchased, here). A tender peek into the emotional landscape of a realtionship, Living Room Stories bridges the spaces between flash fiction and poetry and music. The layered descriptions and building up of resonant imagery both within each piece and across the ‘prose-album’ gives a sense of crisis and rising emotion that can’t help but engage the reader. It is an interesting experiment in creating fiction from music and a beautiful object that truly comes alive when reading along with the music which inspired it. The first edition run of 25 copies sold out in only 36 days but lucky for you, dear reader, the second edition is now available, and I would recommend grabbing a copy while it is still available. If interested you can look at a digital preview Living Room Stories here. You’re very welcome Andy. Living Room Stories is a unique and engaging read.